Ahhh! Time is perhaps one of the trickiest things to teach. They just don’t get it! No matter how many wonderful resources you create, how many hours you spend finding things on twinkl or sparklebox or seomra ranga after day 2 you are ready to scream… or maybe its just me. Anyway, these are some of the things I have tried and used which have worked and hopefully will continue to work! (This lesson would be suitable for children who have already learned o clock, 1/2 past, 1/4 past etc – the first part is a revision for them but could be used as a starting point for younger children too). 1.Teach fractions first. In this way children can make the connection with 1/2 past and 1/4 past. 2.Children should also be able to count in 5’s. Tell them to fold it in half. On the top write o clock and directly opposite write 1/2. Next fold the circle into quarters. Now write 1/4 on one side and 1/4 on the other. Put a dot in the centre and write PAST on the right hand side and TO on the other side. Explain that there are two hands on the clock. The long hand is the minute hand and the short hand is the hour hand. Start with o clock. The long hand stays on 12 and the short hand moves to the different numbers. Next show 1/2 past. Leave the long hand on 6 and only move the short hand showing the different hours. 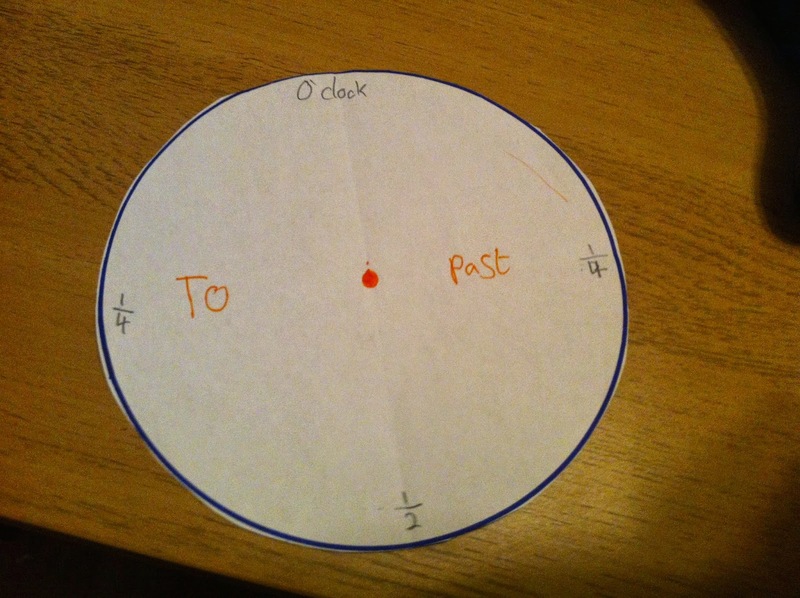 Once the children know o clock, 1/2 past and 1/4 past revise, revise and revise again. Show the children the interactive clock. Show a time. The children show the time on their clocks and then ask what time is it? Repeat. Only when children are secure with o clock, 1/2 past and 1/4 past should you move onto 5 past 10 past etc. When teaching 5 past etc. ask how many minutes in 1 hour. (60) Our clock is divided into 12 parts – each section is 5 mins. Let’s count in 5’s. Children can start at 0 (on 12) and count in 5’s pointing to each digit as they pass. Allow children to continue to do this until they are fully secure with 5 past, 10 past etc. Again practice practice and practice again. Then and only then should you move onto worksheets about past. Continual practice is the only way children will learn time! Once they are secure on the past side of the clock – you can then move onto to.